Posted September 22, 2012 by Josette Farrell in Features. 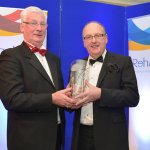 It is a great honour for a parish when one of their own is awarded with the honour as a Galway Person of the Years but last weekend two Claregalway natives were honoured at the Rehab Galway People of the Year Awards. Marie Cahill from River Oaks, Claregalway was nominated for a prestigious award for her commitment to improving the quality of life of individuals with Parkinson’s disease. Marie who is a native of Lydican had cared for her mother Kitty who suffered from Parkinson’s disease for many years up till her passing seven years ago and having received wonderful support, Marie now leads the local Parkinson’s disease support group and carries out wonderful work with families and with fundraising for the charity. Marie is chairperson of the Galway Branch and is the driving force who works tirelessly and voluntary for the association and its members. She is involved in patient information education days and also speaks at multidisciplinary education days for health professionals in addition to developing community services for its members. Marie also organises functions and events to raise badly needed funds. In accepting the award Marie said that this award was also for or all her colleagues and friends who did so much work with her in the fight against Parkinson’s disease. Michael Kearney is a native of Knockdoemore and currently resides in Maynooth. Michael worked in the Agricultural Parts Distribution sector locally and was promoted to look after the Irish operation that involved a moved to Dublin. After several years Michael started his own company which became a market leader in seal distribution. Michael sold his stake in the company and set up a Fuel distribution company to the haulage service that became one of the largest suppliers with revenues in excess of twenty five million euro and after ten years sold his steak in the company. In 2004 Michael Kearney set up the Carlton Hotel group and that company now has grown to be one of the leading Hotel groups in the country with ten hotels including two in his native county. The group have in excess of 1300 hundred bedrooms and a staff of over 900. Michael Kearney has always been involved in organisations and was a leading member of the Dublin-Kildare Galway Football Supporters group that raised huge funds for Galway football starting in 1997 when Galway football was at a low ebb. Michael led the group that paid the deposit for the Centre of Excellence for Galway Football that is now based in Loughgeorge and is also a proud supporter of Connacht Rugby. Michael has spearheaded many charity events through the Carlton Hotel group and has been an advisor to many charities in raising much needed funds. 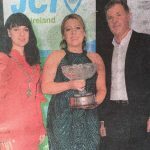 Marie and Michael are both worthy recipients of the Galway People of the year’s awards and the people of the area warmly congratulate them both. They also extend warm congratulations to Fr Sean Kilcoyne who was also an award recipient. Fr Sean served as curate in Claregalway for some time. 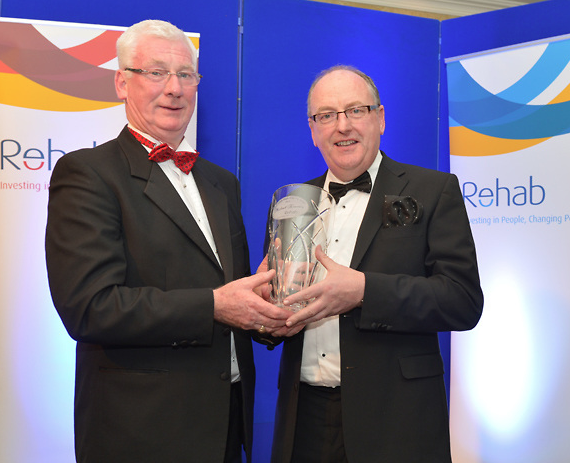 The Rehab Galway People of the Year Awards were presented at a lavish function at the Galway Bay Hotel on Friday night. 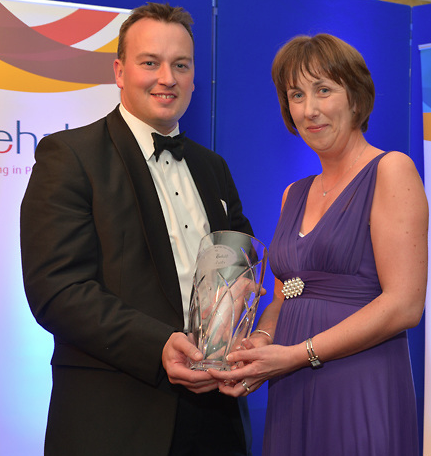 Marie Cahill receiving her Galway Person of the Year Award. Photo via Joe Travers. Michael Kearney receiving his Galway Person of the Year Award. Photo via Joe Travers.